As Labour's Environment Spokesperson on Dundee City Council I welcome the news that Dundee City Council is to rename Caird Park Stadium in honour of the late Ronnie McIntosh. I have fully supported this move on behalf of my Labour Group colleagues. I am delighted that the council has agreed to rename Caird Park Stadium in honour of Ronnie McIntosh. I am delighted that they have listened to the public campaign to honour this man who inspired people here in Dundee and right across the country. His death was really sad news; renaming Caird Park Stadium in his honour will be a fitting tribute. The council also needs to look at the way it supports athletics and disability sport. Finally I would like to say a very big well done to the Evening Telegraph for their excellent campaign. 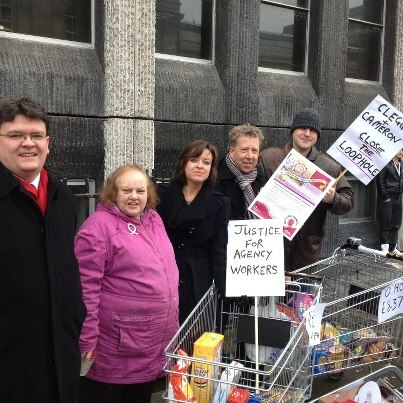 I was pleased to join my colleague Jenny Marra MSP (and Councillor Lesley Brennan not in the picture) and activists from the Communication Workers Union (CWU) to support the CWU's campaign Closing the Loophole - Justice for Agency Workers. At the BT call centre in Dundee around 120 agency workers are employed on ‘Pay Between Assignment’ contracts. This means that after 12 weeks, instead of receiving equal pay with directly-employed staff, they remain on as little as £6.25 an hour, well below the Living Wage rate of £7.45 an hour and around £2.00 an hour less than other staff at the call centre. CWU local spokesperson, John Brownlie, from the Dundee Clerical Branch said: “It’s totally unacceptable many of our agency workers in Dundee should be prevented from the equal pay they are entitled to because of these duplicitous contracts which in essence sign away their rights. Both agencies and hirers are clearly at fault for choosing to use these type of Contracts instead of sticking to the spirit of the law which is meant to award equal treatment after a 12 week qualifying period. “Agency staff should be entitled to equal pay with directly-employed staff doing the same job as them after 12 weeks. It’s not fair to exploit people on £6.25 an hour – less than the Living Wage - and this loophole should be closed. Agency workers should receive equal treatment after 12 weeks in a job, following legislation brought in in October 2011, but a legal loophole allows ‘Pay Between Assignment’ (PBA) contracts which sign away agency workers’ rights to equal pay. Many agency workers are signing these contracts without realising the implications. I support equality and fairness for workers and I support the Living Wage, and I think that a company like BT should be paying the Living Wage. This is a good campaign from the CWU and I support them in their efforts. Monday evening saw meetings of the City Council and its committees start again after the New Year. In the Environment Committee meeting there were a number of reports on improving parks. I was pleased to see progress being made at Camperdown Park and I made the point that we need to see progress on all the assets at Camperdown especially Camperdown House. I look forward to hearing more about progress in the future. The improvements at Dudhope Park are also welcome and I was pleased that my colleague Helen Wright highlighted the work of the Dudhope Park Friends Group. There was also an important report on the Dundee Law Master Plan. I think that this is a welcome report as is the involvement of the Coldside Forum in its development. Over the last couple of years the Law has shown that it needs some attention. Clearly, the Law and the War Memorial at its summit are iconic images of Dundee, indeed they form a large part of the City Council's logo. That's why I was so shocked last year to see that the War Memorial had been vandalised. It is important that we preserve this important part of Dundee's heritage. It is important in the run up to the centenary of the First World War that we remember the sacrifice made by Dundonians who gave their lives for their country. The Scottish Government announced on Monday that funding will be available to conserve and preserve war memorials I hope that the council seeks to access this money to protect memorials in Dundee. Councillor Kevin Cordell spoke with passion about remembering those like Graham of Claverhouse, Viscount Dundee who had shown their support for the Stuart cause in 1689 by raising the Stuart standard on the Law. I think that it is important to remember these events as well and I would support this although I would point out that there is some historical controversy about how popular this was in the town of Dundee at that time. I would also say that Councillor Cordell's party appear to be fully supportive of the Hanoverian cause nowadays. There was an interesting debate at the Policy and Resources Committee about the future of the Hospital Fund and Johnston Bequest. This is a fund which currently gives one person, per year, per councillor, a pension of £80 a year. The proposals before us were to spend money from the Hospital Fund and Johnston Bequest on a pilot on targeted welfare benefits advice to older people rather than more pensions. Since these funds are administered under the terms of Acts of Parliament I sought a reassurance from the legal officers of the council that we had the power to make theses changes. I was told that officers were happy that we did have the power to do this. On that basis I was happy to support the proposals. In the course of the debate there was much discussion about what went on in the seventeenth century and the nineteenth century. Even though I am a historian I made the point that interesting though it may be to discuss what people were trying to do in the nineteenth century we are faced with a situation where the Tory/Lib Dem Government want to take us back to the nineteenth century in terms of support for the poorest and most vulnerable in our society; and that we should be looking to defend people from the worst of this. Therefore I think providing targeted advice to the elderly is a good use of this money and is a modern use of it. I was pleased that the council agreed to my request to set up an action group to try and protect the jobs at Remploy which are threatened by the decision of the Westminster Government to close Remploy. The second meeting of this action group took place this week. It is clear that the council still does not have enough information about the business and that Remploy need to be more forthcoming with information about the business. I think that there could still be hope for a phoenix to emerge from the flames of this business. It is important to support the workers who work at Remploy and who are used to working in that supported environment. I was glad that the meeting started the process of preparing a business case. A lot of the cards land with the Scottish Government and the Council. They can make or break the future of the Remploy workers reviewing how they award Council contracts. They have the power to put workwear uniform contracts directly to supported workplaces and rescue the Dundee factory. The SNP should use their power to make this happen. Along with my Labour colleagues on this action group I will give my continuing support to the Lord Provost as he takes this forward. My colleague Jenny Marra has written a very interesting piece in the Courier where she points out that by using procurement rules in a pro-active way local, and indeed central, government can use their spending power for social goals. In Remploy's case it would be better socially for those employed there to remain in employment and indeed the overall cost to the public purse might mean that it makes more sense to keep them employed. In March of last year when it looked that Remploy Dundee had been reprieved I pointed out just how much procurement matters and this is still very much the case. I was also pleased to Labour MPs including my colleague Jim McGovern raising the issue of Remploy in the House of Commons. It is important that they are listened to. 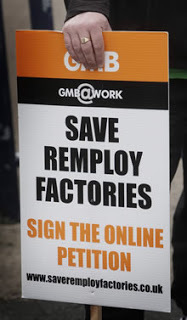 In all this discussion about Remploy it is important to remember those workers who are still facing an uncertain future. In the interests of dignity and fairness everyone should be working for a solution which allows the workforce to remain employed - it will not be easy.